^ a b c d e Barnshaw, John (2008). "Race". In Schaefer, Richard T. Encyclopedia of Race, Ethnicity, and Society, Volume 1. SAGE Publications. pp. 1091–3. ISBN 978-1-45-226586-5. ^ "Opinion | What Doctors Should Ignore". The New York Times. 8 December 2017. ISSN 0362-4331. Retrieved 2018-05-08. ^ Hirschman, Charles (2004). "The Origins and Demise of the Concept of Race". Population and Development Review. 30 (3): 385–415. doi:10.1111/j.1728-4457.2004.00021.x. ISSN 1728-4457. Retrieved 2014-01-06. ^ Relethford, John H. (23 February 2017). "Biological Anthropology, Population Genetics, and Race". The Oxford Handbook of Philosophy and Race. doi:10.1093/oxfordhb/9780190236953.013.20. Retrieved 2018-03-27. 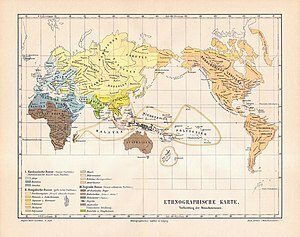 Human populations do not exhibit the levels of geographic isolation or genetic divergence to fit the subspecies model of race. ^ a b Hunley, Keith L.; Cabana, Graciela S.; Long, Jeffrey C. (1 December 2015). "The apportionment of human diversity revisited". American Journal of Physical Anthropology. 160: 561–569. doi:10.1002/ajpa.22899. ISSN 1096-8644. PMID 26619959. Retrieved 2016-01-23. ^ Hunley, Keith L.; Cabana, Graciela S.; Long, Jeffrey C. (1 December 2015). "The apportionment of human diversity revisited". American Journal of Physical Anthropology: –. doi:10.1002/ajpa.22899. ISSN 1096-8644. Retrieved 2016-01-23. ^ "New Ideas, New Fuels: Craig Venter at the Oxonian". FORA.tv. 3 November 2008. Retrieved 2009-04-18. ^ a b Pena, Sérgio D. J.; Di Pietro, Giuliano; Fuchshuber-Moraes, Mateus; Genro, Julia Pasqualini; Hutz, Mara H.; Kehdy, Fernanda de Souza Gomes; Kohlrausch, Fabiana; Magno, Luiz Alexandre Viana; Montenegro, Raquel Carvalho; Moraes, Manoel Odorico; de Moraes, Maria Elisabete Amaral; de Moraes, Milene Raiol; Ojopi, Élida B.; Perini, Jamila A.; Racciopi, Clarice; Ribeiro-dos-Santos, Ândrea Kely Campos; Rios-Santos, Fabrício; Romano-Silva, Marco A.; Sortica, Vinicius A.; Suarez-Kurtz, Guilherme (2011). Harpending, Henry, ed. "The Genomic Ancestry of Individuals from Different Geographical Regions of Brazil Is More Uniform Than Expected". PLoS ONE. 6 (2): e17063. Bibcode:2011PLoSO...617063P. doi:10.1371/journal.pone.0017063. PMC 3040205. PMID 21359226. ^ "IBGE teen". Ibge.gov.br. Archived from the original on 23 September 2009. Retrieved 2011-12-29. ^ "NOVA | Does Race Exist?". Pbs.org. Retrieved 2012-12-30. ^ a b Omi, Michael; Winant, Howard (2014). Grusky, David B., ed. Racial Formation in the United States. Social Stratification: Class, Race, and Gender in Sociological Perspective (4th edition). Boulder, CO: Westview Press. p. 683. ISBN 9780813346717. ^ "Office of Minority Health". Minorityhealth.hhs.gov. 16 August 2011. Archived from the original on 18 January 2013. Retrieved 2012-12-30. ^ "Does Race Exist?". www.pbs.org. 15 February 2000. Retrieved 2017-11-09. Abraham, Carolyn (7 April 2009). "Molecular eyewitness: DNA gets a human face". The Globe and Mail. Phillip Crawley. Retrieved 2011-02-04. Amundson, Ron (2005). "Disability, Ideology, and Quality of Life: A Bias in Biomedical Ethics". In David T. Wasserman; Robert Samuel Wachbroit; Jerome Edmund Bickenbach. Quality of life and human difference: genetic testing, health care, and disability. Cambridge University Press. pp. 101–24. ISBN 9780521832014. Brace, C. Loring (2000). "Does race exist? An antagonist's perspective". Pbs.org. Retrieved 2010-10-11. Conley, D. (2007). "Being black, living in the red"". In P. S. Rothenberg. Race, Class, and Gender in the United States (7th ed.). New York: Worth Publishers. pp. 350–58. Ehrlich, Paul; Holm, Richard W. (1964). "A Biological View of Race". In Ashley Montagu. The Concept of Race. Collier Books. pp. 153–79. Fullwiley, Duana (2011). "Chapter 6: Can DNA "Witness" Race?". In Krimsky, Sheldon; Sloan, Kathleen. Race and the Genetic Revolution: Science, Myth, and Culture. Columbia University Press. ISBN 978-0-231-52769-9. Retrieved 31 August 2013. Lay summary (31 August 2013). Gill, G (2000). "Does Race Exist? A proponent's perspective". Pbs.org. Retrieved 2009-04-18. Graves, Joseph L. (2006). "What We Know and What We Don't Know: Human Genetic Variation and the Social Construction of Race". Is Race "Real"?. Social Science Research Council. Retrieved 2011-01-22. Graves, Joseph L. (2011). "Chapter 8: Evolutionary Versus Racial Medicine". In Krimsky, Sheldon; Sloan, Kathleen. Race and the Genetic Revolution: Science, Myth, and Culture. Columbia University Press. ISBN 978-0-231-52769-9. Retrieved 31 August 2013. Lay summary (31 August 2013). Harpending, Henry (2006). "Chapter 16: Anthropological Genetics: Present and Future". In Crawford, Michael. Anthropological Genetics: Theory, Methods and Applications. Cambridge: Cambridge University Press. ISBN 978-0-521-54697-3. Lay summary (4 December 2013). Kahn, Jonathan (2011). "Chapter 7: Bidil and Racialized Medicine". In Krimsky, Sheldon; Sloan, Kathleen. 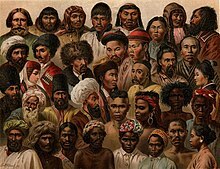 Race and the Genetic Revolution: Science, Myth, and Culture. Columbia University Press. p. 132. ISBN 978-0-231-52769-9. Retrieved 31 August 2013. Lay summary (31 August 2013). King, Desmond (2007). "Making people work: Democratic consequences of workfare". In Beem, Christopher; Mead, Lawrence M. Welfare Reform and Political Theory. New York: Russell Sage Foundation Publications. pp. 65–81. ISBN 0-87154-588-8. Lee, Jayne Chong-Soon (1997). "Review essay: Navigating the topology of race"". In Gates, E. Nathaniel. Critical Race Theory: Essays on the Social Construction and Reproduction of Race. 4:The Judicial Isolation of the "Racially" Oppressed. New York: Garland Pub. pp. 393–426. ISBN 9780815326038. Lieberman, Leonard; Kirk, Rodney (1997). "Teaching About Human Variation: An Anthropological Tradition for the Twenty-first Century". In Rice, Patricia; Kottak, Conrad Phillip; White, Jane G.; Richard H. Furlow. The Teaching of Anthropology: Problems, Issues, and Decisions. Mayfield Pub. p. 381. ISBN 1-55934-711-2. Long, J.C.; Kittles, R.A. (August 2003). "Human genetic diversity and the nonexistence of biological races" (PDF). Human Biology. 75 (4): 449–71. doi:10.1353/hub.2003.0058. PMID 14655871. Retrieved 2009-04-18. Marks, Jonathan (2002). "Folk Heredity". In Fish, Jefferson M. Race and Intelligence: Separating Science from Myth. Mahwah, NJ: Lawrence Erlbaum Associates. p. 98. ISBN 0805837574. Marks, Jonathan (2008). "Race: Past, present and future. Chapter 1". In Koenig, Barbara; Soo-Jin Lee, Sandra; Richardson, Sarah S. Revisiting Race in a Genomic Age. Rutgers University Press. Miles, Robert (2000). "Apropos the idea of race ... again". In Les Back; John Solomos. Theories of race and racism. Psychology Press. pp. 125–43. ISBN 9780415156721. Sivanandan, A. (2000). "Apropos the idea of 'race' ... again"". In Black, L.; J Solomos. Theories of Race and Racism. London: Routledge. pp. 125–43. Smedley, Audrey (2002). "Science and the Idea of Race: A Brief History". In Fish, Jefferson M. Race and Intelligence: Separating Science from Myth. Mahwah, NJ: Lawrence Erlbaum Associates. p. 172. ISBN 0805837574. Xing, Jinchuan; Watkins, W. Scott; Shlien, Adam; Walker, Erin; Huff, Chad D.; Witherspoon, David J.; Zhang, Yuhua; Simonson, Tatum S.; Weiss, Robert B.; Schiffman, Joshua D.; Malkin, David; Woodward, Scott R.; Jorde, Lynn B. (2010). "Toward a more uniform sampling of human genetic diversity: A survey of worldwide populations by high-density genotyping". Genomics. 96 (4): 199–210. doi:10.1016/j.ygeno.2010.07.004. ISSN 0888-7543. PMC 2945611. PMID 20643205. Retrieved 2016-02-10. James, Michael. "Race". In Zalta, Edward N. The Stanford Encyclopedia of Philosophy (Spring 2017 ed. ).